These days, when you buy a new car, you can be pretty confident that it will work just fine. If you have a problem, you know your dealer will fix it for free under a warranty. But what if the dealer can't fix the car after several tries? That's when your state's lemon laws kick in to protect you. Despite great improvements in automobile manufacturing since the 1970s, there are still an alarming number of cars sold each year that can't be fixed. If you recently bought your car and have brought it to the dealer repeatedly to repair the same problem, you can probably return the car for nearly a full refund. I started looking into how lemon laws work after I did a story about BMW engine problems. Some BMW 335 and 535 owners have suddenly lost power. BMW has been replacing these vehicles' high pressure fuel pumps (HPFPs) in response, but it seems that doesn't always solve the problem. I spoke to several owners who had long frustrating negotiations with their dealers, but ultimately were able to return their cars and get most of their money back. They also could have hired a lawyer to handle the negotiation. Thanks to lemon laws in all 50 states (and Washington, D.C.) you can probably hire a lawyer for free who will arrange for the dealer to buy back your car. If an attorney who specializes in lemon laws loses your case, they don't get paid. If they win, it's the car manufacturer who pays the legal fees. On September 15th, I spoke with Bob Silverman, a founding partner of Kimmel & Silverman, P C, which specializes in lemon law cases. According to Silverman, there are two kinds of legal remedies for people who have lemons. The first is to use state lemon laws . If those don't apply, the other is to use a Breach of Warranty (BOW) claim. If you can prove your vehicle has these problems, it's a lemon. The remedies vary based upon the significance of the problem and how many times the vehicle went back in for repair. The maximum remedy under lemon laws is a complete repurchase of the vehicle, including down payment, taxes, tags finance charges, minus a small mileage offset. In most states, this is based on the first time you brought the car into an authorized manufacturers dealership. In some states, it's slightly different, so inquire before filing. The remedies vary by state, but generally your lawyer should be able to get back all the money you paid for the vehicle minus a charge that usually varies based on how many miles you drove it before you first reported the problem. That's the case in Pennsylvania, where you would deduct 10 cents for every mile you drive before you report the problem. If your case doesn't meet the requirements of your state's lemon laws, you may still be able to get some of your money back under a different legal theory -- BOW. The applicable law here is the Magnuson Moss Warranty Act. The idea is that if you keep paying for the car to be repaired and that repair does not work, then the company is violating the repair warranty. If this happens, a lawyer will try to get you back the difference between its Kelly Blue Book value in excellent condition and its value in good or poor condition. The best part of the state lemon laws and Federal Magnuson Moss statutes is that they provide cost-free legal representation to the consumer. There is a fee-shifting provision in the law which states that if the consumer prevails, the manufacturer must pay all attorney fees and legal costs on top of what the consumer receives. To get money back under either law, you need to help your lawyer prove your case. To do that, you should make available your purchase and financing or leasing agreement, your registration card, and a copy of all the repair orders. If you did not obtain that from the dealer, than you need to provide the details of the number of times you had the problem, the number of times you went to the dealer, and the number of times the vehicle broke down afterward. Silverman has seen many problems with BMWs along the lines I described in July. As he said, the problems come with BMW high and low pressure fuel pumps failing, which cause vehicles to lose power. While he is not aware of anyone being killed as a result, he thinks these fuel pumps are a major safety issue. "The BMW fuel pumps are inherently dangerous," he said. "They are a time bomb waiting to happen." He says his firm gets two to five BMW fuel pump cases a week that he handles personally because he is concerned about his clients' safety. Allison Mangot was the original source for my July story. She leased two BMWs in her family, a 335i convertible and a 535xi wagon. Mangot, who never received a confidentiality agreement from the dealer, told me that BMW agreed to take back both vehicles in exchange for cash that reimbursed her for the lease payments and other expenses. She spoke to BMW about buying her out of the lease for her BMW wagon. BMW wanted to pay off the lease and have her lease another car. She declined. BMW paid off the remainder of the lease for the wagon because the car was over two years old. BMW would not give her any money back. Her BMW 335 was newer. BMW reimbursed her "all her lease payments, motor vehicle fees, cap cost reduction and the tires they recommended that she buy to stop the engine rattling noise," according to Mangot. BMW charged her a miles-driven charge based on a formula from New Jersey where she purchased the vehicle. A California-based engineer I spoke with who asked to remain anonymous owned a BMW 335 with 900 miles when his vehicle's engine failure problems started. According to this engineer, BMW eventually bought back the car after repeated complaints. "After they agreed to buy the car it was very easy," he says. "I just left it at the dealership and they gave me a check." 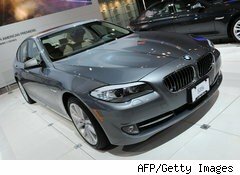 Arthur C. Wheaton, an auto industry expert at Cornell University, thinks that BMW handled this situation fairly. "Buying back problematic vehicles from dissatisfied owners is not that unusual," he says. In commenting on Mangot's deal, he said, "It sounds like all parties came to a mutually satisfactory agreement." However, he thinks that Mangot might have gotten more if she had signed a confidentiality agreement. "I do know that BMW is aggressively trying to get more used BMWs back at the dealerships," says Wheaton. "They do not have enough newer vehicles for certified sales and are trying to buy older BMWs to sell at the dealerships." BMW is not the only company that has problems with lemons. Silverman has found that his most common problem is with manufacturers who have tried to cut costs by making their brake rotors overseas. These cheap brakes end up developing warps, pits, and grooves. When the vehicle owner applies the brakes, the steering wheel shakes and they don't feel safe. Silverman has also encountered problems with General Motors GMC Acadia trucks that have water leaks in their sun roofs. The leaking is so hard to stop that one truck had "mold oozing out of every nook and cranny," according to Silverman. If you have the misfortune of owning a lemon, talking to a lemon law specialist and trying to get your money back from the dealer sounds like a good option to me.